The incident occurred around 8.30pm at the Arrabawn Co-Op in Nenagh. A MAN HAS been seriously injured after he sustained burns to his body at a creamery in Co Tipperary tonight. The man has been airlifted to Cork University Hospital. The incident occurred around 7.40pm at the Arrabawn Co-Op in Nenagh, which is the headquarters for the Arrabawn Group, which is a leading provider of dairy produce to the Kerrygold brand, and also produces animal feeds products. Gardai confirmed the man “was in the creamery” at the time, and that he “received burns”. 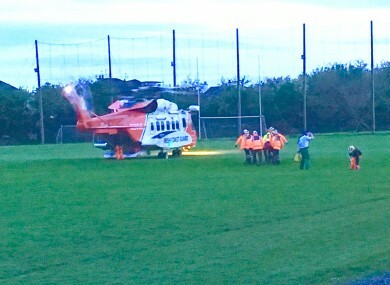 The male casualty was taken by ambulance to MacDonagh Park GAA sports ground in Nenagh, where he was received by members of the Coast Guard Rescue 115 helicopter, which was dispatched from its base at Shannon, Co Clare. The rescue chopper, which earlier had been tasked to perform an airlift form Inishmore Aran Island to University Hospital Galway, transported the seriously injured man from Nenagh to CUH around 9.10pm. Sources said the man was in a serious condition, and was likely to be sent to the specialist burns unit in Cork for treatment. Reliable sources said the man was “seriously injured” after he was “burnt in an accident”. Arrabawn Co-Op confirmed that an accident took place at their main production facility in Nenagh last night. He was treated immediately by our on-site trained first aid representative. Paramedics attended the scene shortly afterwards and he was transferred to Cork University Hospital last evening. Our thoughts first and foremost are with our injured staff member and his family. We remain in constant contact with his family with regard to his condition and offer our support to them in any way we can provide it. The Arrabawn Co-Op was founded in 2001 following the merger of Nenagh Co-Op and Mid-West Farmer’s Co-Op. The group is comprised of an agri-business division, a food ingredients divisions and a dairy division. Updated at 12.20pm 29 April 2017 to include a statement from Arrabawn Group. Email “Man airlifted to hospital after sustaining serious burns at creamery”. Feedback on “Man airlifted to hospital after sustaining serious burns at creamery”.